CANCELLATION OF INTERVIEW FOR THE POST OF REGISTRAR/ DEMONSTRATOR IN VARIOUS DISCIPLINES IN GMC, JAMMU. SHORT TERMS QUOTATIONS OF GOVT. MEDICAL COLLEGE HOSPITAL JAMMU DATED 22-03-2019. ANNUAL REPORT OF BIOMEDICAL WASTE. ADVERTISEMENT FOR THE POST OF PROFESSOR/ASSOC. PROF./ASSTT.PROF./LECTURER IN THE DEPARTMENT OF NUCLEAR MEDICINE, GMC, JAMMU. INTERVIEW NOTICE FOR THE POST OF REGISTRAR/DEMONSTRATOR IN VARIOUS DISCIPLINES IN GMC JAMMU. SHORT TERMS QUOTATIONS OF GOVT. MEDICAL COLLEGE HOSPITAL JAMMU DATED 18-03-2019. SHORT TERMS QUOTATIONS OF GOVT. MEDICAL COLLEGE HOSPITAL JAMMU DATED 14-03-2019. CORRIGENDUM REGARDING LAST DATE FOR SUBMISSION OF APPLICATIONS FORMS OF REGISTRAR/DEMONSTRATOR. SHORTS TERMS QUOTATIONS OF GOVT. 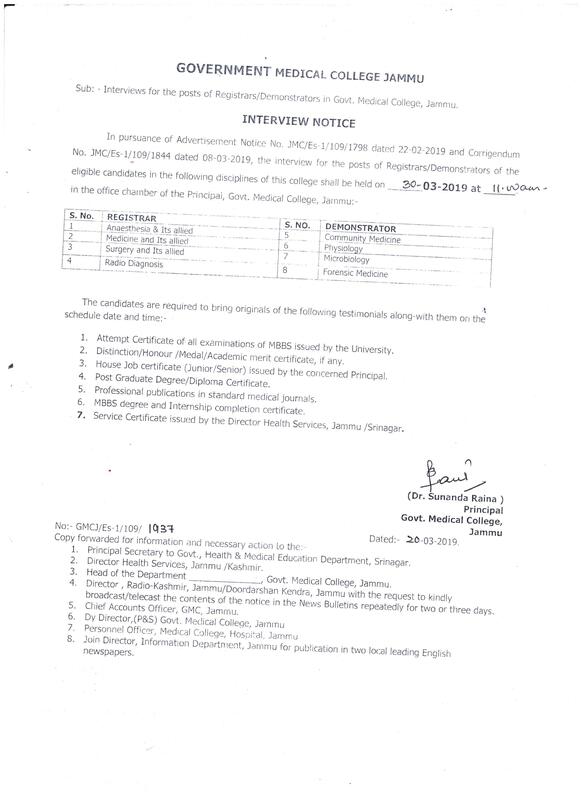 AYURVEDIC MEDICAL COLLEGE JAMMU (DATED: 28-02-2019. Selection List for the training of GNM & Para Medical Assistant Training -course for the session 2018-19. FINAL LIST OF CLASS-IV EMPLOYEES OF GMC & ITS ASSOCIATED HOSPITALS JAMMU FOR UNDERGOING PARA MEDICAL TRAINING AT AMT SCHOOL JAMMU AS IN-SERVICE CANDIDATE. ADVERTISEMENT NOTICE FOR THE POST OF PROFESSOR/ ASSOC. PROFESSOR/ ASSISTANT PROFESSOR IN MEDICAL ONCOLOGY, GMC, JAMMU. ADVERTISEMENT NOTICE FOR THE POST OF PROFESSOR/ ASSOC. PROFESSOR/ ASSISTANT PROFESSOR/ LECTURER/ REGISTRAR IN NUCLEAR MEDICINE, GMC, JAMMU. WALK IN INTERVIEW FOR CONTRACTUAL STAFF UNDER PROJECT HOSPITAL BASED SENTINEL SURVEILLANCE FOR S. PNEUMONIA AND OTHER INVASIVE BACTERIAL. WALK IN INTERVIEW FOR CONTRACTUAL STAFF FOR ANTIMICROBIAL RESISTANCE (AMR) PROJECT UNDER NCDC DEPARTMENT OF MICROBIOLOGY GMC JAMMU. SELECTION LIST OF DEMONSTRATOR IN THE DEPARTMENT OF PATHOLOGY GOVT. MEDICAL COLLEGE, JAMMU. SHORT TERM QUOTATIONS OF VARIOUS ITEMS CD HOSPITAL JAMMU DATED 29-12-2018. SELECTION LIST OF REGISTRAR/ DEMONSTRATOR IN VARIOUS DISCIPLINES OF GOVT. MEDICAL COLLEGE, JAMMU. ADVERTISEMENT NOTICE FOR VARIOUS POSTS IN GMC & ITS ASSOCIATED HOSPITALS JAMMU ON ACADEMIC ARRANGEMENT BASIS UNDER SRO-384 DATED 14-12-2009. ADDENDUM FOR WALK IN INTERVIEW FOR THE POST OF FACULTY IN GMC JAMMU. APPLICATIONS ARE INVITED FROM THE IN-SERVICE FMPHW CANDIDATES WORKING IN Gmc & ITS ASSOCIATED HOSPITALS FOR ADMISSION (S) TO THE GNM TRAINING (LATERAL ENTRY) IN AMT SCHOOL JAMMU. ADVERTISEMENT NOTICE FOR HIRING OF CONTRACTUAL SERVICE UNDER NATIONAL HEALTH MISSION J&K. SYNOPSIS/ THESIS WRITING PROTOCOL- SOP AS PER UNIVERSITY OF JAMMU NORMS- PRESENTATION BY DR. VISHAL TANDON. CANCELLATION ORDER OF JUNIOR ASSISTANT. APPOINTMENT AS SENIOR STAFF NURSE IN THE PAY SCALE OF (9300-34800+4200) IN HEALTH & MEDICAL EDUCATION DEPARTMENT DIVISION CADRE JAMMU. ADDRESSAL OF NEW FIRST PROF. MBBS FOR THE SESSION 2018-19. TIME TABLE FOR NEW FIRST YEAR MBBS STUDENTS W.E.F. 16-08-2018. CANCELLATION OF SANCTIONED LEAVES OF DOCTORS/ PARAMEDICAL STAFF OF GOVT. MEDICAL COLLEGE & ITS ASSOCIATED HOSPITALS, JAMMU. SCHEDULE III (i.e. LIST OF EQUIPMENTS) RECEIVED FROM MEDICAL COUNCIL OF INDIA. RETIREMENT MEMO 01-01-2018 TO 31-12-2018. SURVEY FOR MONITORING THE NATIONAL NON-COMMUNICABLE DISEASE (NCD). RE-SCHEDULE FOR INTERVIEW FOR THE POST OF REGISTRAR/ DEMONSTRATOR IN VARIOUS DISCIPLINES OF GOVT. MEDICAL COLLEGE JAMMU. FOR PUBLIC AWARENESS REGARDING CEILING PRICES OF THE CORONARY STENTS. CIRCULAR REGARDING FORM 26 AS (TRACES) 2016-17 FINANCIAL YEAR.